Considering that all your movies have been acquired with filters mounted on a filter wheel you can just process each one separately (and therefore repeat the tutorial several times! ), and then combine into one. To add the 3 color images, go to the sub-menu "(L)RGB" of the "View" menu. A dialog box appears...Indicate the names of the 3 images GREEN RED and BLUE. 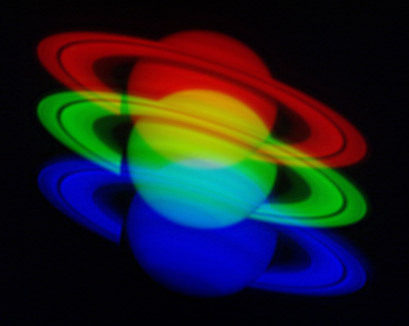 Click on "Apply": a color image appears, resulting from the superposition of the 3 color images. Usually they are not perfectly aligned, the blue layer tends to "smear". 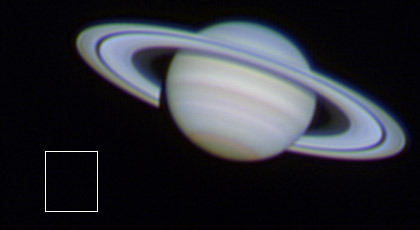 This phenomenon is particularly visible on the image SATURN below (unfortunately here it is more a problem of the telescope's optics - chromaticism - than anything else because the blue layer continues to smear even after the correction). If you have problems aligning the color layers, adjust the "Step" around 0.2 pixel and check the color layer on which you want to act. Then use the 4 arrows to move the image until it is perfectly stacked. By choosing a more than one pixel "Step", you can easily separate the tri-color image into its 3 primary colors. When you're done, click on "OK". 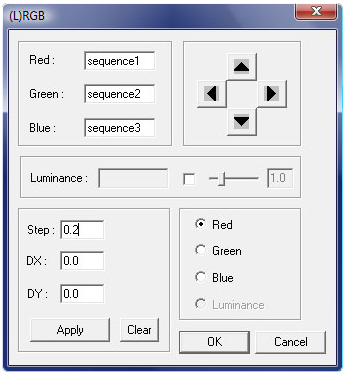 If you are still not satisfied by the color's rendering you can always change the white balance manually. Go in the sub-menu "White balance adjustment" from the menu "View". Adjust the sliders until you get a good image. Remember to save the final image! So, your image only has to be saved! To do this, go to the "File" menu, then "Save As" and choose a non-destructive image's format (eg., bmp). If you want to show your masterpiece through the Internet, convert your image to jpg via the "File" menu and "Save for Web" option that allows you to select the compression ratio to be applied (70-80% is recommended).